Inclusion in higher-ed is a common interest among this year’s cohort of fellowship winners. Recognizing outstanding leadership in postsecondary education, the 3M National Student Fellowship offers its recipients exposure at their home institutions and on the national academic stage. Fellows in this year’s cohort, however, seem less interested in having their own voices heard and are more focused on highlighting the voices they say are missing in higher education. The 3M National Student Fellowship was started in 2012 by 3M Canada and the Society for Teaching and Learning in Higher Education (STLHE), both of which also sponsor the 3M National Teaching Fellowship. While academic achievement is a factor in the adjudication of the student fellowship applications, it isn’t the only consideration. “We aren’t necessarily looking for A-plus [students]. We are looking for a student who is solid, but who understands educational leadership and the role of leadership inside educational institutions,” says Maureen Connolly, the fellowship’s coordinator. This year, 119 applicants vied for 10 fellowships that were split evenly between graduate and undergraduate students. Each fellow receives $5,000 and funds to cover registration, accommodation and travel to the STLHE conference. At the conference this summer in Sherbrooke, Quebec, the fellows collaborated to present a plenary session on a topic they chose together. Top: Mohammad Asadi Lari, Amy Blanding, Michael Graeme, Yahlnaaw/Aaron Grant, Deborah Jenkins. Bottom: Alexandra Meikleham, Maxwell Nicholson, Martha Paynter, Cara Samuel, Chloé Soucy. Each fellow spoke of a different marginalized voice, much of them rooted in personal experience. Chloé Soucy, a recent English literature graduate from Bishop’s University, says she spoke about her experience with developmentally and intellectually disabled kids, and how higher education is not typically presented to them as an option. “We talked about marginalized groups, specific people, parents, family, things like that,” says Yahlnaaw/Aaron Grant, a 3M Fellow from the University of Northern British Columbia who is entering a master’s program in First Nations studies, specializing in Skidegate Haida language and story revitalization. “In this case, my own voice was missing, so by bringing my language and guidance from my mentors I was able to regain my voice.” She says she wants to support others in doing the same. As part of the award, the fellows are invited to participate in a collaborative project, which is facilitated through STLHE. The students are currently deciding what that project might be, but some are also considering ways they can leverage their fellowships into change at their home institutions. “I was also hoping that this would provide a platform, essentially a conversation starter, with my own university to start implementing some of the ideas I have to improve diversity and things like that on campus,” says Ms. Samuel. 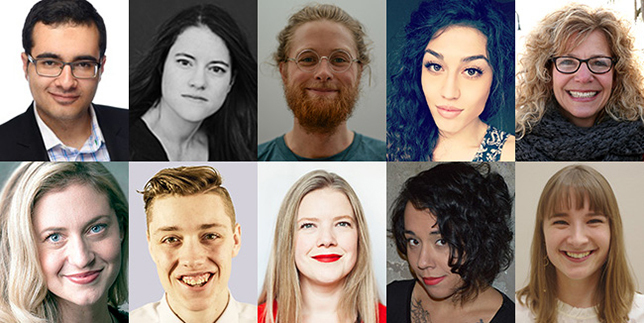 To qualify for the 2018 3M Fellowship, nominees had to be enrolled full-time in a postsecondary Canadian institution (university and college) and have completed at least one full semester of study at the time of application. Next year’s cohort will see a significant, but temporary, change. STLHE is instituting a one-year moratorium on graduate students as they revise the criteria for their qualification. Ms. Connolly’s term as coordinator also finishes this year. She will be replaced by Cynthia Korpan from U of Victoria. Additional information on each of the student fellows is available at the STLHE website.